A key question on everyone’s mind when they launch a website is “How do I get people to visit my site from search engines?” It’s a tough question to answer because there are a lot of factors at play, but the overall rule of thumb is to provide accurate and concice descriptions of the page in question in the header of that page. On this 12th Day of WordPress we’ll look at how to make your site and its content more accessible through the use of the very effective All In One SEO Pack plugin. What does the All In One SEO Pack plugin do? The All In One SEO Pack plugin is a smart little tool that rewrites the title, description and keyword tags for your posts, pages and index pages. This is important because by default WordPress will grab your post or page title as the title tag and either the first few sentences of your post or your post excerpt as the description. That means if you have a page or post with a nondescript title like “About” and start it off with an image and some generic text or a quote or something, that’s what the search engines will see and index. In addition WordPress will always put your site name first in the title tag, so for example the title tag for this page would be “Design Is Philosophy – The Pink & Yellow Media Blog – Day 12 Using the All In One SEO Pack Plugin. With the All In One SEO Pack the title is instead “Using the All In One SEO Pack Plugin – Design is Philosophy” which makes way more sense and is way more descriptive. And as a bonus, the title tag is also what is displayed at the top of the browser window, in browser tabs and as the titles of bookmarks, so changing them to be more meaningful makes it easier for people to know where they are and what they are looking at. More on that later. 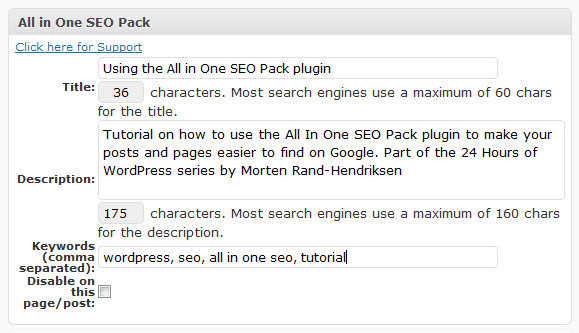 The All In One SEO Pack plugin is available from the WrodPress Plugin Directory which means you should be able to install it from right inside WordPress under Plugins -> Add New. If for some reason this option is blocked due to overbearing security measures you can also install it manually by downloading the zipped archive from the directory, unzipping it and uploading it to the plugins folder found under wp-content in your WordPress installation. Once the plugin has been installed, activate it and we can get to work. Immediately upon activating All In One SEO you will get a huge red warning at the top of the admin panel (as in the image above). The warning, ominous as it may look, is actually just telling you that you need to configure and enable the plugin before it takes effect. I wish it was a yellow warning instead but who am I to complain, right? To get to the admin page and configure the plugin you can either click the link in the warning or go to Settings -> All In One SEO. The top of the Options page you’ll see a pile of ads. To get rid of them you have to buy the Pro version (currently on sale for $39). If you’re a blogger or you’re just running one site you can skip this, but if you’re doing industrial sites and the likes it may be a good idea to pay up. Your choice. Scrolling down you’ll see the actual options for the plugin. And there are a lot of options. When I first started using this plugin a couple of years ago the list was much shorter but even though it may seem like way too much, this new exhaustive list is actually much better. I’m going to go through some of the key options and give you some tips. The rest are pretty slef explanatory and you can also click on each of the option titles to go to a help page with further instructions. For the plugin to work the Plugin Status must be set to Enabled. No surprise there. The only reason I mention this is that when there is an update for this plugin (and they come on a monthly basis now it seems) the plugin always gets disabled and you have to go back and enable it again. Quite annoying really. Here you set the title tag for the Home page. This title will override whatever the title is for your home page, whether it is an index page (blog) or a static page. This is especially useful for blogs because without this function set your home page title tag would be the title tag of the most recent post. Very confusing. Set the Home Title to the name of your site combined with a short description of what it is. 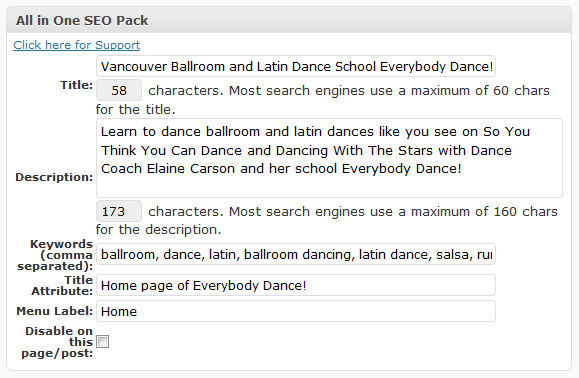 For the Everybody Dance site we set it to “Everybody Dance! Vancouver Ballroom Dancing School with Elaine Carson, Dance Coach”. Same as above this function overrides the description of the home page. This is especially important if you are using an index page (blog) as your front page. Make the description an accurate description of what the site is all about, and try to make it short with the most important info at the top. There is a lot of debate whether keywords are all that important any more, especially because Google keeps mulling about ditching them alltogether. Keywords used to be the primary focus of SEO but is now way way down on the list. Nevertheless it can’t hurt to insert some accurate keywords (with an emphasis on accurate). Add whatever keywords are appropriate for your home page and move on. Leave these as is unless you have some particular reason to turn them on. The next options is a series of title formats for each of the main types of content (post, page, category, archive, tag, search, description, 404, paged). Like I said in the introduction WordPress’ default is to put the site name first and the post or page title second in the title tag. These are the functions that change this order to put the content title first and the site title second. The default settings are good but you can change them around if you want. For instance I tend to change the | to a – because I think it makes more sense semantically. But that’s just me. Only really matters if you have Custom Post Types in your site, in which case I recommend you get the Pro version of the plugin for further features. The next series of options are a bit of a toss up for me. You can change them if you want and it really is something that must be decided on a site-to-site basis. In general I leave them as default because I’m lazy and it works quite well. You can provide a comma separated list of pages you don’t want to be affected by the All In One SEO Pack Plugin. This may sound strange but it makes sense if you are using a plugin that creates a lot of dynamic pages like an advanced calendar or a forum. In general it’s not something you need to worry about. Very cool feature for nerds like me. This option will add whatever you put in there directly to the header of your site. So if you want to leave an Author META tag you can without having to mess with the theme. I’ve also seen people use this to add custom stylesheet calls (not recommended) and even analytics code (definitely not recommended). Do with it what you like, but remember: Whatever you put in is copied verbatim to the header, so if you insert broken code, you break the page. No real explanation is required here. When you’ve made changes to your settings always remember to click Update Options, otherwise your changes will be lost. And if for whatever reason you want to reset everything, you can by clicking the Reset Settings to Default button. I don’t recommend it. With the plugin installed and configured it’s time to actually use it. The plugin adds a new tab to the edit page for posts and pages and that’s where you will be interacting with it. The Post and Page options differ ever so slightly so I’ll deal with them separately. But before we get started, here’s a tip: When you first open the post or page editor after installing this plugin it will appear towards the very bottom of your page. To make it easier to access (and ensure you actually use it) I recommend moving it up to fit directly under your content area. You do this by simply grabbing the grey bar at the top of the tab and pulling it up to the position you want. WordPress will remember this position for the future. Before we actually Above you see a screengrab of the All In One SEO Pack tab for this post. As you can see I now have the ability to set a custom title, a custom description and custom keywords for each post from right within the post. And if I so desire, there is also an option to disable the function for this particular page or post. 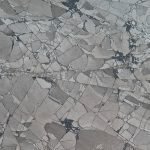 Here is my general tip: When writing a page or post, give it the normal title you want (like “The tutorial that will change your life” or “About”) and then set the All In One title to something descriptive (like “How to increase the findability of your site” or “About Design Is Philosophy”). That way you get the best of both worlds. As for the description, write a two sentence description of exactly what the post or page is about. This is that little blurb people will see when they find you on Google so make sure it’s good enough to catch their attention right away. Pages have two more options added to those of posts: Title Attribute and Menu Label. These interact with the WordPress 3 Menus function meaning if you have a menu item pointing to this particular page (and everything is set up correctly in your theme) you can change the label (the word(s) that show(s) up in the menu) and the title attribute (the screentip that shows up when you hover over the menu item) from right inside the page. This doesn’t always work so be careful. And always alwasy always remember to put a descriptive title attribute on all your menu items, either from the All In One plugin or in the menu settings. This helps Google and your visitors understand where the buttons are pointing. The All In One SEP Pack should be an integrated part of your writing process, whether you are running a blog or a company website. By making it part of your content creation process you ensure that you serve up the best possible content for search engines and the people who use them and in the process you increase your own findability. We just installed All in One SEO on this website we are working on. Does the red configuration warning go away once you choose your settings and click on update? We have done this and the red warning is still there. You have to check the “enabled” button at the top of the options to activate the plugin. Same goes every time you update it as well. For some reason it gets disabled in the update process. 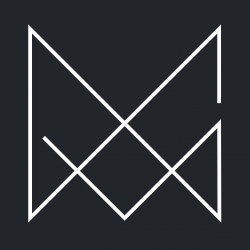 Very comprehensive blog about the SEO plug-in, Morten. Nowadays, I don’t think a website can survive without that pack unless of course, you don’t want people to find out about your blog—which in a way, is paradoxical.